We can give your business a fesh new look! Custom Logo Wall Faountain! 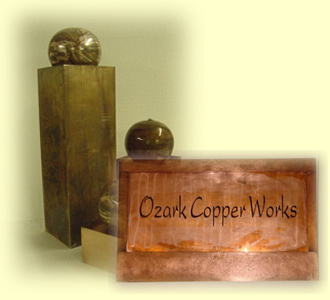 Custom Copper Fountains is committed to creating functional pieces of art to suit your needs. Giving each piece the special attention and care. We have standing, wall and floor model fountains with many designs to choose from. 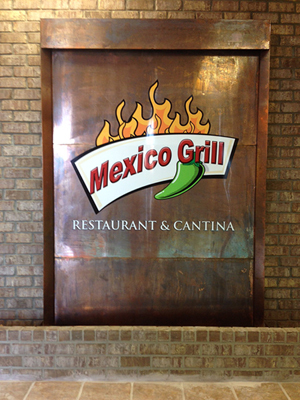 Need a custom logo fountain? We specialize in that too! 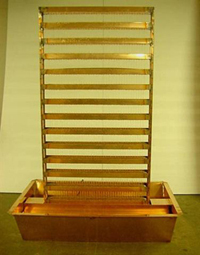 See a video of our Large Ripple Wall Fountain! In business since 1992 we've been producing products designed to your specifications and needs. Each piece is as individual as our customers are. 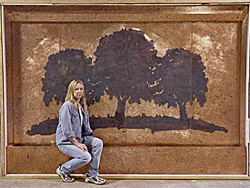 With forty years of metal working experience, we can produce creative, functional pieces of art with high quality craftsmanship from copper, stainless steel or aluminum. ALL our fountains are welded, not glued, epoxied or siliconed. We have fountains to fit most any budget. Looking for that special fountain? You've come to the right place! We welcome your comments and you can sign our Guest Book at the bottom of this page. Custom water wall fountains is our speciality. We have made fountains for many homes and businesses and we can make one for yours. With a simple phone call or email we can start working on your new logo fountain, large wall fountain or just about anything you have in mind. 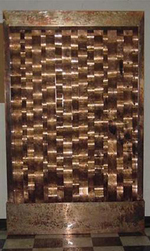 Below are just a few samples of our custom wall and floor fountains.